Five insurgents have lost their lives in a failed bid to infiltrate a community in Maiduguri, to cause havoc, the News Agency of Nigeria (NAN) reports.The incident took place on Aug. 5 at Kaleri community in Maiduguri, the National Emergency Management Agency (NEMA) confirmed on Monday in Maiduguri. Witnesses said that five powerful explosions rocked the Borno capital at about 7: 30 p.m. to 8: 00 pm, putting residents on edge. The Northeast Zonal Coordinator of NEMA, Mr Bashir Garrga, who confirmed the development, said that three residents also injured during the incident.Garga said that the failed attack involved two females and three males, who detonated Improvised Explosive Devices (IEDs) strapped to their bodies, causing harm to only themselves. 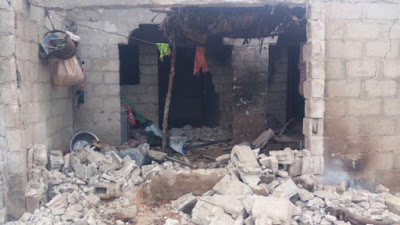 Malam Bello Danbatta, Head of Emergency Response of the Borno State Emergency Management Agency, also colloborated the story, saying that the two male bombers detonated their explosives behind a security cordon in the Kaleri area. He explained that the suicide bombers were apparently targeting scores of residents in Kaleri community. “One of the female bombers targeted a home, where a man and his wife were sleeping outside and detonated her explosive, injuring them. “The other female bomber knocked on a house and as the owner was opening, she quickly detonated her IED. “The third bomber only destroyed a building, killing only himself. “Nobody was killed except the bombers. They were trying to sneak into the neighborhood to cause havoc but their plans failed. “Their dead bodies were evacuated to the state’s specialist hospital by the team. The injured were taken to the hospital by their love ones,” Danbatta said. Boko Haram insurgents have been terrorizing Nigerian’s expansive northeast since 2009 in an insurgency that has claimed thousands of lives and displaced millions. The jihadists, however, appeared to have been decimated by federal troops but the insurgents have resorted to hitting soft targets intermittently.